Sign-up form is below the flyer and the text….. The Jewish Women’s Association of Hong Kong’s Annual Charity Bazaar will take place on Sunday, May 19, 2019. We have served thousands of buyers in the past who come to enjoy excellent bargains on housewares, branded clothes for men, women and children; toys and bags; great food and fun kid’s activities. Setting up the Bazaar on May 19 from 8 am-12 pm: unpacking boxes and organizing items on tables. Selling items on May 19th from 12-4 pm – housewares, clothing, shoes, bags, toys and holiday items, etc. For teens who volunteer, the JWA will sign school documents in order for them to obtain their requisite Community Service Hours. All goods sold at the Bazaar are donated to the JWA by various donors and our entire team during the actual event is comprised of volunteers. The income from the Bazaar goes to charities in Hong Kong and Israel that assist children and woman with cancer, breast cancer screening, education, medical counselling and psychological support. We are ready to take you, your family, and friends on this wonderful mitzvah as volunteers! Make a difference and have an awesome day at the same time! Share your talents and your time for a great cause. Please sign up to become a volunteer today! 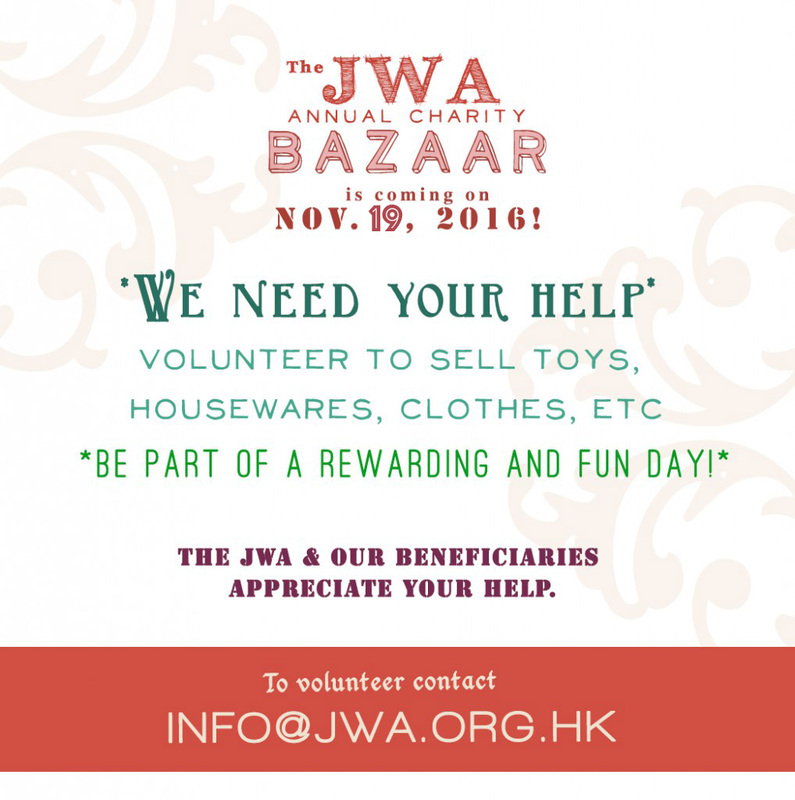 You can e-mail the JWA at info@jwa.org.hk or fill out the form below. We are counting on you to make this Bazaar another great event that shows how truly wonderful our community really is! 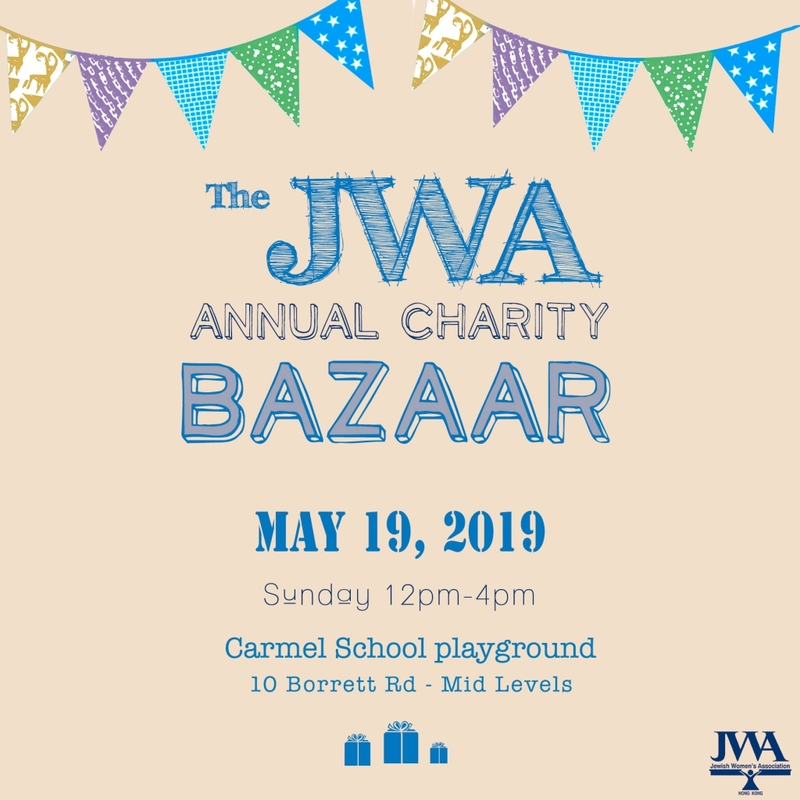 The JWA Bazaar is 19 May 2019! You may select as many as you like - we'll be happy to work with you for all of our good causes! Looking to feel at home in Hong Kong? Looking to meet new people and make new friends? Looking to learn a new skill or develop those you have? Looking to do something interesting? Contact us to learn more of what you can do and how you can help.